Pink yarn, check; blue yarn, check; children...? What can you do to better organize your room? Do you have trouble finding things because they never are where you believe you left them? Is it impossible for you to locate papers and bills in your office and is that room down the hall that is full of stuff up to the ceiling always beckoning you to enter? If the answer to even one of these questions is yes, you need help in learning how to organize your room. If you are wondering where to begin, find solace in knowing you are not alone in the seeming insurmountable task of learning how to organize your room. If your whole house needs organization, then begin with the room in which you spend the most time. Cleaning up the basement or the garage might be something that needs to be done, but the clutter there (at least hopefully) is contained. It�s better to start with that room where your daily life is most affected. 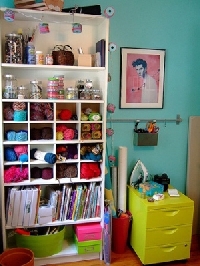 If the room is very cluttered, organize things by the largest object or area. For example, if you have a large bureau, organize everything in the bureau, and then move on to something else, like a bed or desk. What are some things you can do to learn how to organize your room? Get one big plastic bag and begin with a small area of the room. It can be a closet or a desk or a chest of drawers. Spread everything out in an area that you will need to be cleared, like on top of your bed or blocking an important entrance and/or exit. This is very helpful if you have trouble following through or tend to postpone chores. If everything is on your bed, you can�t get into it when the time comes to go to sleep. One can suppose you might attempt to sleep on top of the heap if you don�t mind hangers or the rustle of papers. As you sort through the debris of your life, ask yourself five questions for each item and then separate the item into that respective pile. The five pivotal questions for which you should not spend more than a few minutes answering are: � Should I throw it away? � Should I give it away? � Have I worn, used or played with this item in the last year? � Can it still be used? � Would this item work better somewhere else? You must consider yourself on a �search and destroy mission� as you learn how to organize your room. Be heartless; throw everything in the throw away pile out in one garbage bag. (Do not pass go and do not collect $200.) For those items you wish to give away, put them in another labeled bag and make arrangements as soon as possible to transport them wherever you have decided they will do the most good. For those things you have decided to keep, store them differently. This makes all the difference in learning how to organize your room. For those items you know that you will not use that much, use containers and store them in less traveled locations, such as the bottom of a closet, under the bed or in the basement or attic. Separate those things you need every day into categories. For example, put all your writing utensils in a large cup or container where they can be easily accessed. For those things you have decided might work better somewhere else, now is the time to decide about �else�. Think carefully about whether you really need them or if it is just �separation anxiety� that is dominating your decision. If they really don�t belong anywhere, you course of action couldn�t be clearer: throw it away or give it away. When storing items, remember to build up and not out. Store things on shelves and not in the center of the room. Try listening to music to distract you from the trauma of making these decisions. How to organize your room is a procedure that may hurt at first, but in the end will serve you well throughout the whole house.